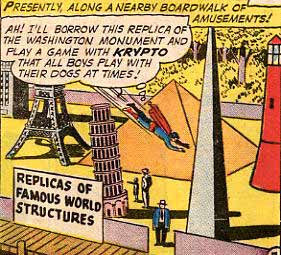 “I’ll borrow this replica of the Washington monument and play a game with Krypto that all boys play with their dogs at times!” says Super Boy in a panel from Adventure Comics #262 published in July 1959. Building Collector reader Scott D. sent me this image and Steve from Superman Home Page sent me some additional information. Contracting ‘super rabies’ from an exposure to kryptonite, an out-of-control Krypto becomes super-sized and goes on the rampage. Super Boy uses the miniature buildings replicas to distract his colossal canine. Have you seen other comics employing miniature buildings in their storylines?